China's first domestic sci-fi blockbuster The Wandering Earth has dominated the box office and online film review sites during the Chinese New Year holiday, which many viewers have seen as a reflection of Chinese values such as self-sacrifice and a sense of duty in dealing with doomsday scenarios. Debuting on February 5, the Chinese New Year's Day, the blockbuster topped the holiday box office, raking in 1,918 million yuan ($244 million) as of press time, according to statistics from Maoyan, one of China's biggest online ticketing platforms. On Douban, China's leading movie review platform, it received 8 out of 10. The film was adapted from a story by Liu Cixin, who won a Hugo Award for his sci-fi series The Three-Body Problem in 2015. The Wandering Earth takes place in the far future as the Sun begins to die. To save themselves, humans join to build enormous planet thrusters to propel the Earth out of the Sun's orbit to a new star system, a 2,500-year project. The film takes place over 36 hours, telling the story of people around the world working to prevent the Earth from crashing into Jupiter. Analysts and moviegoers noticed the differences between this Chinese sci-fi epic and Hollywood movies, which are both about "people's adventures and heroics in unfamiliar outer space," moviegoer Diao Honglin told the Global Times on Sunday. "It amazed me that we humans are taking the Earth with us instead of going to another planet," she said. Zhao Songhui, a graduate student at Duke University in the US, plans to watch it for the third time with her friend. She watched it first on the day of release and sobbed through the second half with many other viewers. "This is not a superhero movie or a Wolf Warrior in space. The long journey and saving of the Earth is for all humans as a community," Zhao told the Global Times on Sunday. Wolf Warrior is a popular 2015 Chinese military action movie. 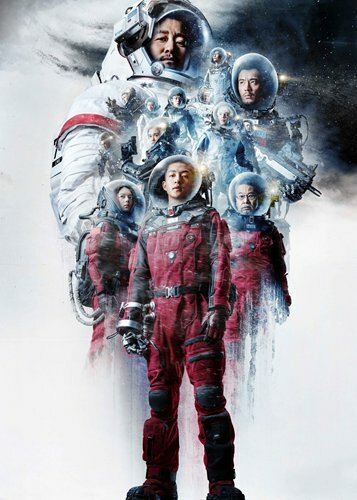 Shi Wenxue, a Beijing-based film critic, noted that The Wandering Earth's overarching message is one of the "collective success of mankind that goes beyond race and nationality," seen in the sacrifice of a Russian astronaut and cooperation from international teams. Characters in the movie will not arrive at a new homeland in their lifetime, but every single person is getting closer to the destination as part of the human race, Zhao said. Chinese moviegoers have been looking forward to a good-quality domestic sci-fi film, especially after sci-fi novels by Chinese authors have won international recognition and awards, Shi said. It is not perfect, but far beyond my expectation of a domestic sci-fi film, Zhao said, mentioning a scene when the Earth is slowly propelled away from the moon, which usually represents homesickness and nostalgia in Chinese culture. Chinese virtues such as self-sacrifice, a sense of duty, and loyalty were behind the futuristic setting and communicated well to domestic audience, which tells us "sci-fi stories ultimately discuss social issues of ethics and civilization," Zhuang Xihai, a former TV host and producer, told the Global Times on Sunday.